* an up-to-date international and cross-cultural biography. "Language Policy in Schools (LPS) is a welcome update of Corson's earlier Language Policy Across the Curriculum and Oral Language Across the Curriculum texts. Unlike its predecessors, LPS has been adapted specifically to the North American school context….is well worth owning, studying, and using. ESOL teachers will find it extremely helpful in their struggles to get administrators and decision makers in their schools to fully understand what language minority students need. Professional development staff will find it extremely useful in putting together resources and strategies for staff training sessions. Principals will find it invaluable in leading staff and school governors through any changes that need to be implemented in response to changing school demographics. Postgraduate teacher trainers will also find it worthwhile in their courses when dealing with either policy or language topics. David Corson is to be congratulated for writing a purposeful text that delivers exactly what the publisher promises." "…one real strength of this book is the way it encourages teachers to take professional responsibility for the evolution of a language policy….Justice, equity, and language are inextricably interrelated and this interrelationship underpins the thinking of this book. It is a valuable and timely contribution to the field." "This book contains a good combination of practical suggestion with a theoretical orientation. 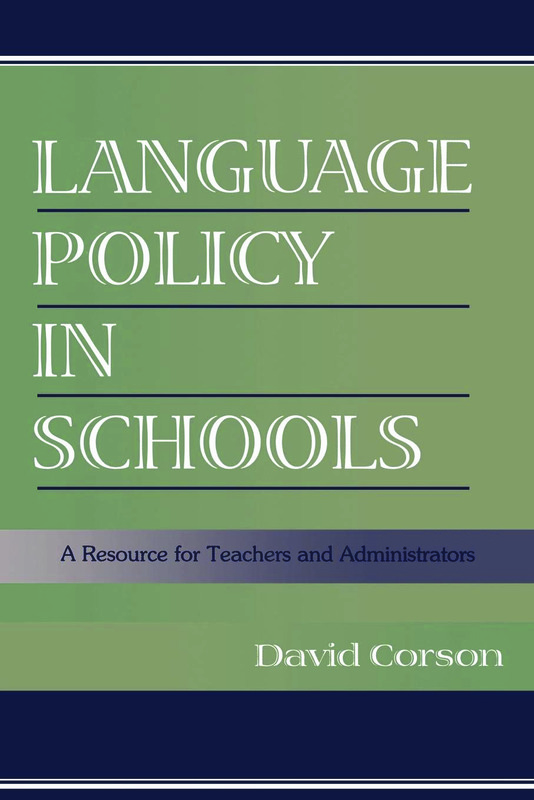 As a practitioner, I am encouraged that Corson chose to write a book on school-level language policy. It is a sign that the teacher, who is closest to the student, can be a powerful force, an "emancipatory leader," in educating for social justic through language policy development and critical language awareness." "The book, Language Policy in Schools: A Resource for Teachers and Administrators, by David Corson, is a delightful, one-of-a-kind, practical guide that describes a process for building my ideal program….Corson's text fills a huge gap in a market that usually addresses students' needs more categorically….I commend the late Corson's text as one which, if followed carefully, provides a stunning and straightforward anecdote to the ills of many of today's literacy programming difficulties." "David Corson argues forcefully and convincingly that language policy should drive efforts to improve schools in an age of cultural and linguistic diversity. This book is unequivocally the best example I have ever read of what teachers and administrators can actually do to tackle issues of social justice, socioacademic achievement, bilingualism, and multiculturalism in their schools by examining and implementing school policy organized around language and literacy concerns. Corson takes a critical stance on language policy, providing a strong but accessible theoretical foundation for why and how language policy can inform what ultimately happens in schools and classrooms. And there is more: The book includes myriad case studies and examples from actual school sites in a style of writing that will ring true to teachers and administrators. This book propels the centrality of language for school policy well into the 21st century, making it essential reading for educators concerned with the needs of children and adolescents from diverse languages and cultures." Contents: Preface. Language Policy in Schools. Critical Approaches to Language Planning for Social Justice. Fact Gathering for School Language Policies. Critical Policymaking. English as a First Language in the School Curriculum. Critical Language Awareness in School and Curriculum. ESL and Minority Languages in School and Curriculum. Concluding Summary: What a School Language Policy Might Contain.